Dr. Baruffi attended Rutgers College in New Jersey and enrolled in their Honors Program. He also received his graduate degree from the Pennsylvania College of Optometry (now Salus University of Pennsylvania College of Optometry). Dr. Baruffi did his residency in the Veterans Hospital in Cincinnati, Ohio. He has a Bachelor of Arts degree in History and a Doctor of Optometry degree. Dr. Baruffi became interested in low vision because of his grandmother who suffered from age related Macular Degeneration which took away her central vision – coincidentally, she had Retinitis Pigmentosa, an inherited eye disease that took away much of her peripheral vision. Dr. Baruffi says his grandmother had low vision the whole time he knew her. He remembers having to write out recipes on large cards for her. He feels that his personal experience with his grandmother is what led him to want to help low vision patients and many of things he did for his grandmother are very similar to what that he is doing for his low vision patients now. Dr. Baruffi primarily practices general eye care, but also serves about three low vision patients a week. 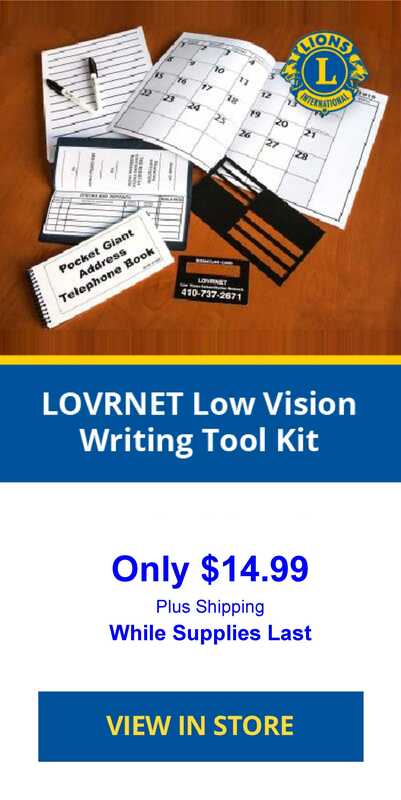 Low vision can be challenging for a solo practitioner because of the amount of time that has to be devoted to exploring the consequences of low vision on the patient’s daily life and developing and testing different strategies that work best for that patient. This is where the patient interviews and direct service by Lions LOVRNET Volunteers make it possible to integrate these services in a general practice. Low vision rehabilitation is not something that can be accomplished in one visit. One of the challengers that Dr. Baruffi sees is how to get the patients with more severe visual impairments extended low vision rehabilitation services with occupational therapists, low vision rehabilitation therapists, and orientation and mobility instructors, especially for patients who do not meet the eligibility criteria for state programs. To compound the problem, the state Division of Visually Impaired (DVI) has limited funds for rehabilitation. Dr. Baruffi helps these low vision patients with getting magnifiers and/or other low vision aids. Additionally, he provides suggestions on how to modify their homes to make them more safe and livable. Dr. Baruffi will be traveling once a month to Sussex County near the seashore with DVI to provide services to low vision patients there. 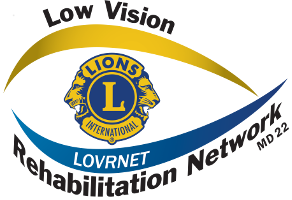 Dr. Baruffi is delighted to be a part of LOVRNET and he is anxious to learn how Lion volunteers can help his low vision patients even more, especially when the patient encounters problems in their homes. Dr. Baruffi suggested that a way Lion volunteers can help his low vision patients is to accompany them to his office so that his instructions, which are now written out for the patient, could with the patient’s permission, be heard by the Lion volunteer. They then could follow-up with the patient to help implement the compensatory strategies learned in Dr. Baruffi’s office. Lion volunteers are now being trained by low vision rehabilitation specialists to be able to provide that kind of direct service.